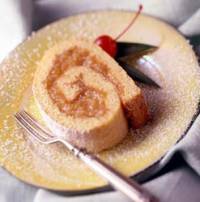 A moist jelly roll cake with the rich filling of pineapple upside down cake. Heat oven to 375°F. Grease 15x10x1-inch jelly-roll pan. Line with waxed paper; grease waxed paper. Set aside. Beat egg whites in small mixer bowl at high speed until foamy, 1-2 minutes. Continue beating, gradually adding 1/4 cup sugar, until glossy and stiff peaks form, 2-3 minutes. Set aside. Combine remaining 1/2 cup sugar, egg yolks, baking powder, vanilla and salt in large mixer bowl. Beat at medium speed, scraping bowl often, until well mixed, 1-2 minutes. Gently stir in egg whites, alternately with flour, until just mixed. Pour mixture into prepared pan. Bake for 10 to 15 minutes or until center springs back when lightly touched. Immediately loosen cake from edges of pan. Invert onto towel sprinkled generously with confectioners' sugar. Remove pan; peel off waxed paper. While hot, starting with 10-inch side, roll up cake in towel. Cool completely. Combine all filling ingredients in 2-quart saucepan. Cook over medium heat, stirring occasionally, until mixture comes to a full boil, about 8-10 minutes. Continue boiling 1 minute. Refrigerate until completely cooled, 2-3 hours. Unroll cooled cake; remove towel. Spread cake with cooled filling. Starting at short end, roll up cake. Transfer to serving platter. Cover; refrigerate until serving time. To serve, cut jelly roll into slices. Garnish with confectioners' sugar, whipped cream and cherries, if desired. I made this for my father, who loved this recipe. although it wasn't my favorite of cakes, i did enjoy it when throughly chilled, and smothered in confectioners' sugar. a very simple recipe that will please and delight guests.